It was a surprise to see Tom Kimber-Smith’s name – sorry, rephrase that… Le Mans winner Tom Kimber-Smith’s name - against a SAMAX Riley Pontiac at next week’s Homestead test. “I fly out tomorrow (December 2), have a seat fitting at the team’s workshop at Fort Lauderdale on Sunday, and then I’m testing on Tuesday and Wednesday,” says the Team LNT regular. The contact with SAMAX came about through driver manager Rick Gorne and SAMAX team owner Peter Baron, who made a habit of testing and racing new (to the Rolex Series) drivers this year. LNT team-mate Rob Bell had several races in the SAMAX Porsche in the GT Class. 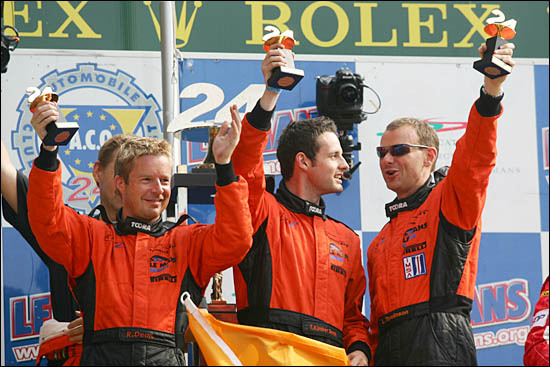 Here he is on the podium at Le Mans, with Richard Dean and Lawrence Tomlinson either side of him.